Browsing articles from "October, 2008"
The Fix – Reimage’s newsletter for November 2008 is out! 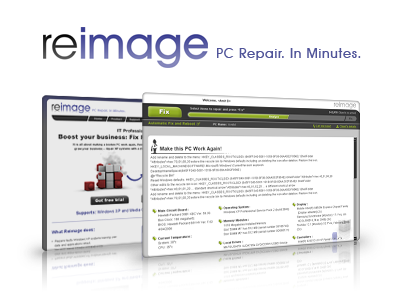 Increase in Repair Scope – Reimage is now more thorough in its repair approach and offers, since version 1182 (3rd of October), an unprecedented quality of repair. Anti-Virus Integrated – Reimage now employs AVG Anti-Virus to clean up the viruses effecting the operating system.Coming next: remove viruses, in one click, not only from the operating system but from the hard-drive as well. PC Repair Reports in all Subscription Accounts – View, within your account, an automatically generated report of your customers’ PC, serving as a dashboard to track your Reimage usage. Looking through the Microsoft knowledge base, I stumbled upon this neat little list of the most popular KB articles of the last three months. Through these popularity ratings, you can see the information that most people are looking for, and this can give you a vague idea of the most common problems encountered. Number 17 on the latest chart is an article describing the manual solution for a corrupted registry. AntiVirus 2009 – Don’t feed the beast! Anti-Virus 2009 nearly swindles another helpless victim! Reimage’s R&D Director’s girlfriend was saved from paying the ransom! A long, long, time ago, a computer virus was a program that would delete some files, format your disk and generally vandalize your PC. Nowadays, viruses are about making $$$. Viruses have become a $14 billion Dollar industry that is all about stealing your money with bogus software or generate traffic to websites. As I am writing these lines I see the title on the news website – “2.2 Trillion USD lost”. 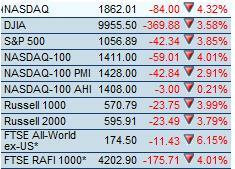 The world is in recession! My way to define a recession is when people will keep their money deep in their pockets and will not spend it. This means less of a turnaround, less production, less salaries, you get the point. It is a self sufficient system. I, f course, have only one thought, is it good for our business Reimage? Clearly, YES! Who needs a PC repair? I am getting this question a lot! Who needs PC repair and what operating systems need repairs? Here is a graph of the volume of the search for problems with related to XP, VISTA, and MAC. 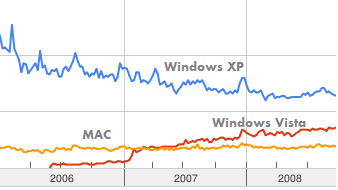 It obvious now that XP is going to be around for some time. Vista is not picking up yet and the recession is slowing down the new PCs purchasing. With that volume, about 1 million PCs in the states need help, per day! My first post and I am doing it without my PC, why? Because my Vista is down again. One of my Vista’s 500,000 objects has probably been overrun by another object causing my entire machine to hang and run slowly. Don’t get me wrong, I think that Microsoft are doing an amazing job building the most common and scalable platform that anyone ever made – but, with so many moving parts, statistically, something will not work right. So, what can I do now, having no PC to work with?